Born in Springfield, Illinois in 1915 and raised in Los Angeles, CA. 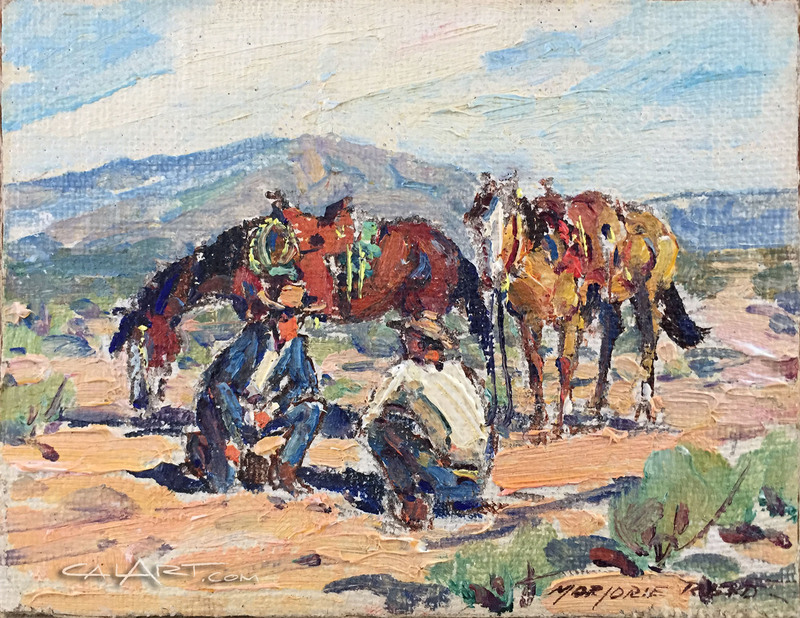 Marjorie Reed gained a reputation for paintings of western scenes, particularly Butterfield Overland Stage coaches and other scenes of cowboys, horses and figures associated with the Overland Mail Route. Marjorie Reed is known to have signed some of her paintings with men's names including Harvey Day and Fred Day. Marjorie began art lessons from her father, a commercial artist, at a very young age and she later assisted him in the designing of Christmas cards and with illustrations for the Mickey Mouse Beverage Company. Marjorie Reed was so accomplished that shortly after, she was hired by Walt Disney Studios to do animation. But as her passion was painting, she quickly lost interest with this line of work and quite the Disney job. In the mid-1930s, Marjorie Reed studied at the Chouinard Art School and took lessons from Jack Wilkinson Smith, a renowned landscape painters who was a key artist in establishing the Biltmore Salon in Los Angeles. Knowing her love of the outdoors and horses, Smith encouraged her to roam the countryside. Marjorie became a friend of Captain William Banning who had been a stagecoach driver for his father Phineas Banning. She learned the romantic story of the Butterfield Overland Mail Stage, which, from 1857 to 1858, ran from San Francisco to the Yuma crossing on the Colorado River. Based in Los Angeles from the late 1930s to late 1940s, Marjorie Reed traveled the stage-coach route in her Model-T Ford and sketched paintings of various points along the route. Her travels included Palm Springs, which she visited many times after her first stop in 1937, and Julian, a California mountain town. Marjorie Reed's "Butterfield Stage" series, about the 1858 Butterfield Overland Stage from St. Louis to San Francisco was completed in 1957 after years of travel and research, and a book titled The Colorful Overland Stage was published with twenty of her color reproductions and text by Richard Pourade. In 1967, she finished a second set of Overland Stage illustrations focused on Arizona. A third set was then devoted to New Mexico and Texas and a fourth set to Oklahoma, Arkansas and Missouri. This is one of 4 Marjorie Reed "minis" I just acquired. Painting measures 3 1/2" x 4 1/2" and is in excellent condition. Signed lower right "Marjorie Reed" and titled on back "Resting Horses".